The first paper (PDF) presents a novel, partial audio-score alignment based methodology to identify the audio performances of a composition (or compositions performed in an audio recording). The method is tested on a dataset consisting of audio recordings and music scores of Ottoman-Turkish makam music and achieved around 0.95 mean average precision (MAP). For additional information, you can refer to the companion page (link) of the paper. The second paper (PDF) presents a statistical model for musical notes. The model is generated from the pitch contours of each note accumulated from audio score alignment. It is intrinsically tested by a raaga classification task on a representative dataset of audio recordings and music scores of Carnatic music and shown to outperform a state-of-the-art method. For additional information, you can refer to the companion page (link) of the paper. The conference takes place in Hamburg, Germany between 31 August and 3 September 2016. 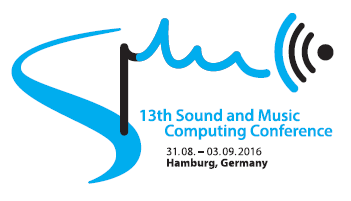 The SMC Conference is an international scientific conference around the core interdisciplinary topics of Sound and Music Computing.